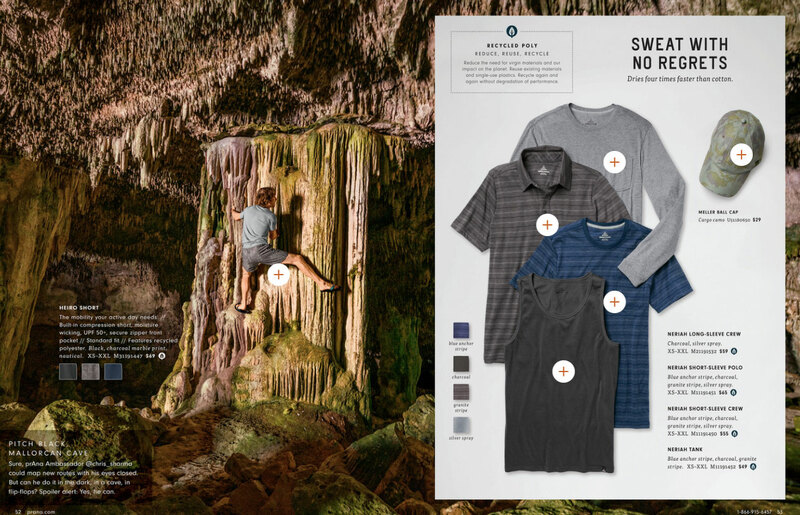 A controversial image of Chris Sharma in prAna’s spring 2019 catalog ignited outrage among the caving community. But it also helped bring an important issue into the mainstream. 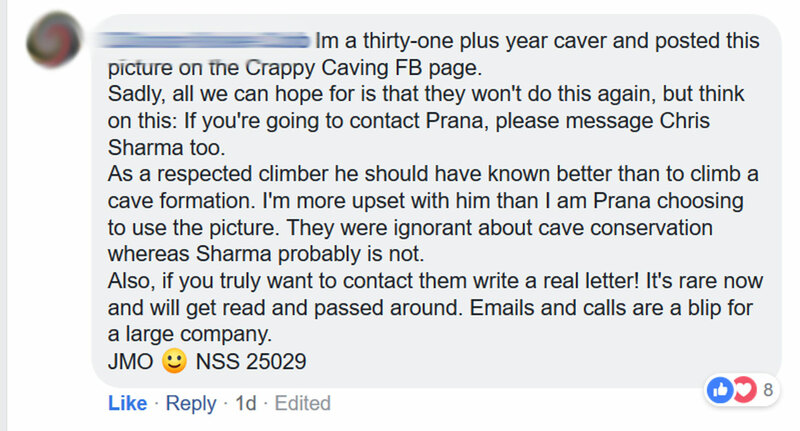 Update: Following this story, prAna removed the image of Chris Sharma from its catalog and replaced it with a message from its president, Russ Hopcus. View it here. Unfortunately, the structure he wrapped himself around is a stalactite. This cave feature that takes hundreds or thousands of years to form and is so sensitive that its surface reacts with the oil on our fingers. The brand has since removed the image and replaced it with an image from prAna president, Russ Hopcus. This may not be obvious to the common prAna customer. But cave stewards immediately took to social media to voice concern that the image may inspire irresponsible and destructive behavior in these delicate places. 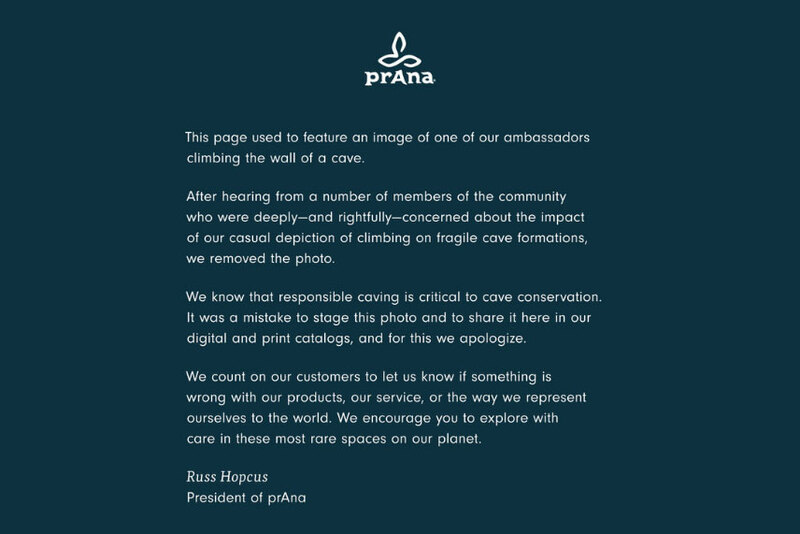 The backlash was swift, and prAna promptly responded to address the seriousness of the issue. After the catalog went live, the controversial image quickly found its way to the Facebook group Crappy Caving. Members immediately castigated the company and athlete. Not long after, angry cavers shared the image to the official National Speleological Society Community group and other outdoor-focused communities. In fact, much of the outrage stemmed from the fact the image appeared in a prAna catalog. Historically, that brand has prided itself on sustainable practices and preservation of the environment. At issue is the unique sensitivity of caves versus traditional climbing rocks. Caves are not subject to the elements in the same way rock climbing areas are. There are no wind, precipitation, daylight, or temperature fluctuations to temper the environment. As a result, any physical changes such as a footprint or hand mark may last hundreds or even thousands of years. Cavers argue the structure Sharma clung to for the catalog took hundreds or thousands of years to form and will likely show the impact of his climbing for generations. Fortunately, prAna’s response was swift and in line with its reputation. Shortly after the image made rounds across the internet, prAna’s PR team sent a message to all who contacted them. In it, brand president Russ Hopcus acknowledged the gaffe and apologized. “In one of our Spring 2019 catalogs, a photographer that we hired took a photo of one of our ambassadors, Chris Sharma, climbing in Mallorca, Spain. Many cavers and conservationists understandably expressed outrage after seeing the photo, concerned about the impact on the formation pictured as well as the behavior modeled. We know that responsible caving and care for fragile cave environments is critical to cave conservation. It was a mistake to shoot this photo and to share it in our catalog, and we deeply regret that this occurred. We are reaching out to cave conservationists to learn how we can make amends for our mistake and be part of the ongoing solution. Moving forward, we will conduct a more detailed review of all of our creative processes to ensure that we tread lightly in delicate places during photo shoots, location scouting, and other business activities to have a minimal impact on the environment. We will also partner closely with our ambassadors to ensure their practices align with our values. Shortly after Hopcus’ apology, Geary Schindel, president of the National Speleological Society, responded. He noted Hopcus contacted him personally and said he was optimistic about the future. He also asked the caving community to be compassionate and patient as the two organizations work together. Milosz Pierwola is an attorney turned humanitarian explorer who has trained with world record holders in some of the world’s most extreme environments. From dog sledding under the northern lights in the frozen Yukon Territory to surfing with world champions in Brazil and filming the VR/360 documentary of Everest Base Camp with an award-winning humanitarian organization, Milosz authors his own stories on his website AdventureMilo.com and contributes to publications around the world. His presentation “Become Your Hero” has inspired over 10,000 people on three continents, and his writing has been featured in multiple languages, all contributing to diverse humanitarian initiatives that continue to benefit from his dedicated efforts. Find out more at AdventureMilo.com.